Latin American Olympic sailing fans will be wishing Brazil's Robert Scheidt good winds at Beijing, twice winner of the Olympic Laser class he has now switched to the twin-man Star, in which he claimed a world title in 2007. Between 1995 and 2005 Scheidt won eight world championships in his Laser, a single handed small dinghy class where only Britain's Ben Ainslie challenged his supremacy by snatching the world titles of 1998 and 1999 and more painfully at the Sydney 2000 Games. 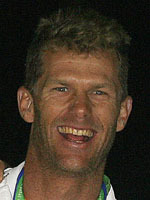 Scheidt won the Atlanta gold ahead of the then 19-year-old Ainslee, and also won the Athens title in 2004 where the Briton won Finn class (also single-handed but far heavier) gold. Scheidt and Ainslee were at the pinnacle of Laser at Sydney 2000 and while the younger man held the lead through the early regatta Scheidt took the overall lead in the penultimate race. Ainslee adopted a blocking tactic to win gold by simply finishing ahead of the Brazilian in the final regatta, a controversial but eventually effective method that has always stuck in Scheidt's throat. By 2006 at the age of 32 Scheidt opted to switch to the popular star class, a craft double laser's size and almost ten times its weight and with two large sails and a crew partner, Bruno Prada. The pair came second at the 2006 worlds but in the Atlantic waters off the coast of Cascais, Portugal they claimed the world gold in 2007. His parents got him interested in sailing at the age of nine at a boating lake outside Sao Paulo. He had his first major victories in the small Optimist class, becoming South American champion at 12 and 13. He passed on to Snipe class before taking to the Laser at 17, in which he became world junior champion in Scotland. He won his first national title in 1992 and followed that his first world title in 1995. He was also voted world's best sailor in 2001 and 2004 and goes to Beijing with a keen desire to claim a third Olympic title.